WaterMelon Games, the studio behind Pier Solar, returns with Paprium, a colorful 16-bit brawler. The game takes place in Asia following a devastating nuclear war known as Paprium. You fight your way through a 24-level cityscape with one of three warriors: Tug, Alex and Dice, or a couple of unannounced characters, going it alone or teaming up with a friend in 2P co-op. In typical beat 'em up fashion, players will smash enemies with their fists and feet, perform powerful throws, double-tap dash, and beat up the occasional environmental object for some tasty items. Players can also pick up weapons like pipes and chains to lay down heavy damage or fire extinguishers that freeze enemies in place. 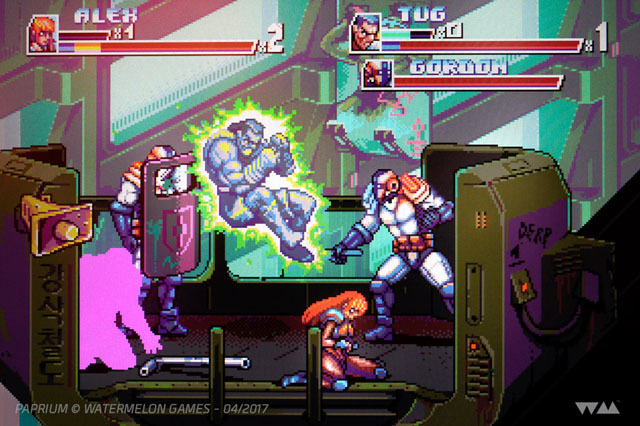 The Arcade Mode allows for straightforward brawling, while the Original Mode has branching paths, save points, and multiple endings. The game is coming to the Sega Genesis console (it will run on actual Genesis consoles, not aftermarket systems) in a standard cartridge with plastic clam shell case and full color manual, or in a limited edition deluxe version. In conjunction with the game's release, the studio is releasing a limited number of 8-button fighting sticks that will be compatible with the Genesis and USB devices. All items area available for preorder on the game's website.